Bespoke Packing and Palletising Solutions | PAK Automation Ltd.
Posted Jan 31 2010 by admin in PAK Automation Ltd. When there’s a packing or palletising problem, PAK Automation will design, build, install and commission the best possible solution on time and within budget. PAK Automation systems are custom-built and can be tailored to meet the specific needs of the customer. Our systems are flexible can be adapted to include the labelling and packing requirements of your operation. Safety is of utmost importance and our equipment meets the strictest requirements laid down by international law. PAK Automations control systems are designed to meet the exact requirements of the end user and the degree of automation required for the specific application at hand. 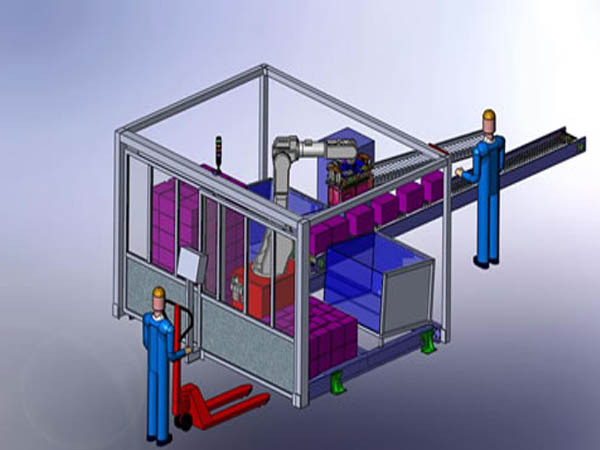 Robotic Palletising Cell for 15 kg boxes.